L.A. Brooklyn Bridge Boot Camp | Roasted Fennel: How to keep full during intense periods of exercise var scss_share_image=""
We just started the December Intensive Slim & Strong session last Thursday. It’s called “Intensive” because for two weeks we meet for daily workouts that are an intense combo of cardio and strength training. The windows have been steaming up, the workout shirts are drenched, and our faces look like we just got out of the shower. You can imagine how hard everyone’s working during these two weeks. Increased exercise intensity and frequency can make you hungrier. Just like many marathoners in training notice how they are hungrier than usually, lifting heavier weights and upping the intensity, can ramp up your appetite. To counteract hunger and prevent weight gain, make sure you eat your protein within an hour of finishing your workout. Muscles need to repair and rebuild. Make sure you take in good carbs with your protein. The carbs help stimulate the release of insulin, which drives the protein into the muscle cells. A little is all that’s needed. Too much insulin will signal your body to store fat, so balance is key. I have been cooking up veggies galore over the past two weeks. I spent a couple hours this past weekend making my faves. I keep them in big storage containers in the fridge and eat them for breakfast, lunch and dinner during the week. It is impossible to overdo it on veggies. They’re filling, nutritious and have quite a few health benefits. I always pair the veggies with a lean protein, such as eggs, turkey meat balls or chicken. I have a few faces that I’ll introduce you to next week. The fennel came out deliciously moist, fragrant and still had a little bite to it. Take 2 fennel bulbs, cut the stalks off and half the bulb lengthwise, then cut into 1 inch wide pieces. Rub the pieces with olive oil and a little balsamic vinegar. 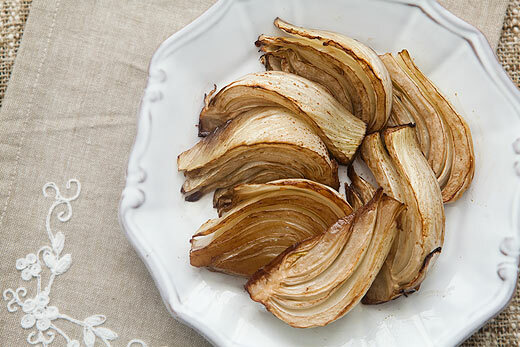 Lay the pieces on a baking sheet and roast for 30-35 minutes at 400 degrees F.
Fennel is great for your digestion. It soothes gas and bloating. It is high in Vitamin C and with that boosts your immunity, fights free radicals, and helps strengthen your cells. It is high in fiber, potassium, manganese, folate and molybdenum. Fennel also contains rutin and quercetin, which give it a high antioxidant activity. Interestingly, fennel contains a phytonutrient called anethole. In animal studies anethole has been shown to reduce inflammation and prevents the occurrence of cancer by shutting down an important gene-altering molecule. Feel like quitting sometimes? Don’t! Can people really change?